Companion apps and games are becoming more commonplace. 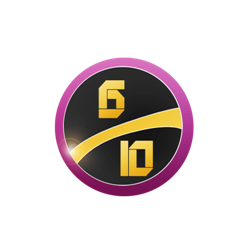 These days they are not only to be used for raising awareness of a title and cross-promotion, but also to help flesh out the game worlds. Hellraid is an action hack and slash game currently in development by Techland for release on Xbox One, PS4 and PC in 2015. The game was intended to be an add-on for dead Island, but has become its own standalone title, complete with a prequel iOS game: Hellraid: The Escape. Whereas Hellraid will be a thoroughly action-based affair, The Escape adapts itself a little more wisely to touch-screen devices by becoming a sort of horror-puzzle hybrid. The title is quite literal in that the story sees you take on the role of an unnamed protagonist, who finds himself trapped in a kind of Hell, looking for a way to escape. Suffering from amnesia, all you have at your disposal are your wits and the helpful notes left behind by a fellow survivor, who wants your help do that you can both escape. 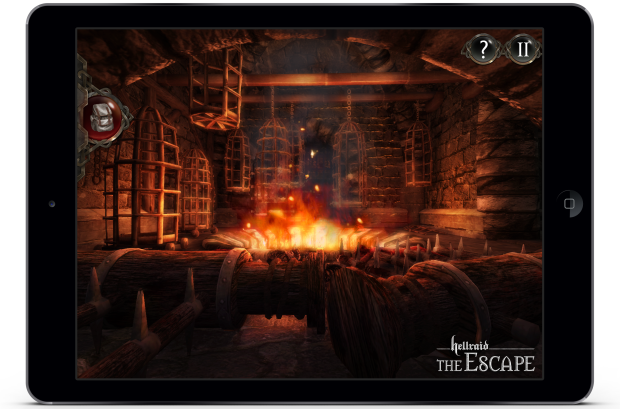 The Escape consists of seven separate levels, each of which contain a selection of puzzles and physical traps to navigate, whilst also avoiding the demonic inhabitants of the realm. None of the puzzles are too taxing, and you can turn on a (not especially helpful, actually) hint system for cryptic clues. There are some enemies to encounter, but all must be defeated by clever use of the environment and traps, rather than fighting. The action is controlled with a virtual joystick for movement, and dragging the screen with another finger to look around. This all works fairly well, except on the odd occasion where the virtual joystick decides to move location on-screen, which is a little puzzling. You will find obstacles where you must move mirrors to redirect a beam of light around a room, playing chess in order to unlock a secret compartment, and throwing rocks to flick switches and push levers. Most work pretty well on the touchscreen, and have intuitive controls that anyone could work out straight away. There are a few sections where you can possess other creatures to help your escape, and these can be a little disorientating thanks to the rather twitchy controls. On top of that, throwing rocks can be difficult to get right, and you will end up having to back-track a lot. So there are a few frustrating elements at play. What does let the game down a little is that despite the pretty decent graphics (making use of the Unreal 3 engine), creepy and atmospheric sound effects, The Escape doesn’t do a great job of creating a scary atmosphere. Instead it creates one where you are afraid that one slight wrong move will see you fail a puzzle and die – having to try again. Admittedly, dying doesn’t reset your progress, it only forces you to return to the nearest crypt in each dungeon, but more or less everything in the game can result in instant death if you aren’t careful, so you’ll have to restart and retry many times. There is some creativity in the puzzles, and some levels make use of more subtle approaches, whereas the final Dungeon is almost like one long chase boss battle. But with only seven stages the title is woefully short. There are free updates promised, but who could say how much content that they will add to the title. VERDICT: Hellraid: The Escape provides some fairly satisfying puzzling, and the idea that you shouldn’t have to kill enemies, but rather outsmart them, is a welcome change of pace. The atmosphere is a little predictable and the dingy dungeons don’t offer anything unique in the way of design, but the skulls, spiders and bone-crushing traps do fit the genre pretty well. The Escape asks you to keep trying different things until you stumble across the correct solution, so can become a little repetitive and frustrating, though the short run-time means you won’t find yourself stuck for too long. 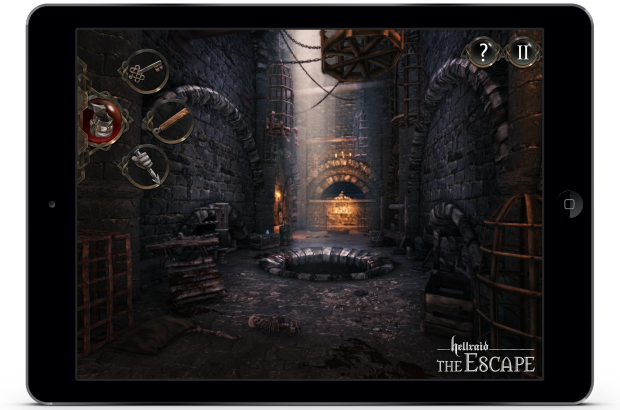 It is a shame that, whilst The Escape may represent the style of the final game, there are unlikely to be any of the puzzling gameplay elements present in the full Hellraid game.